This deluxe, 100% natural cotton flour sack towel features a hand screen printed image of a free roaming “Chicken” from the coast of Maine. Flour sack towels are super soft, lint-free, ultra absorbent and dry faster than normal kitchen towels. These towels are pre-washed, pre-shrunk and unlike standard flour sack towels, these towels are hemmed on all four sides. Flour sack towel measures approximately 30 x30, sizes can vary slightly. 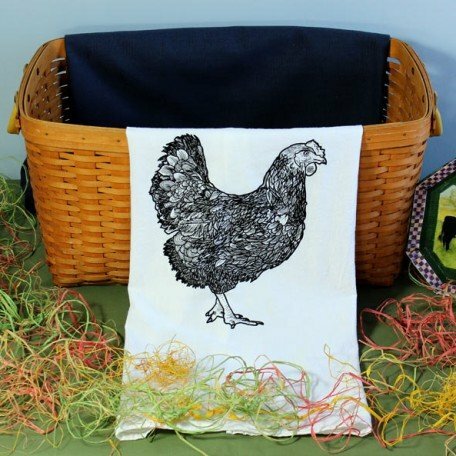 This flour sack towel featuring a farm chicken is screen printed in Maine. This would make a great gift for that person in your life that has a cottage, vacation home or farm. 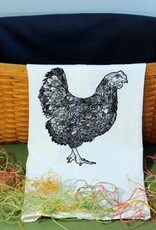 This one of a kind, custom, flour sack tea towel would make a special addition to your kitchen décor.